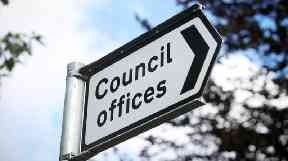 Council budgets have dropped 8.3% in real terms from £10.5bn in 2010/11 to £9.6bn in 2017/18. Councils: Cultural and leisure services have taken a hit (file pic). Council umbrella body Cosla has warned that funding cuts mean local government performance is "simply unsustainable" in the long term. A new local government benchmarking report showing spend, service performance and satisfaction levels across Scotland's 32 local councils found overall funding is down almost £1bn since the first report was produced eight years ago. Council cash has dropped 8.3% in real terms from £10.5bn in 2010/11 to £9.6bn in 2017/18, it found. Spending in education and care is said to have been "relatively protected" in this period, with these areas accounting for more than 70% of benchmarked expenditure in the report. As a result, most other service areas have "experience substantial real reduction in spending" including a 22% drop in culture and leisure, a 34% fall in planning, a 15% drop in roads and environmental services down by 10%. Despite the pressures, successes highlighted include a continual improvement in pupils' performance in education since 2011/12. The most rapid improvement is in the most deprived areas, with average scores up around 30% since 2010/11. However the rate of improvement is said to have slowed in the past two years for all groups which "reflects and overall slowing in progress to close the attainment gap". Satisfaction with schools has fallen for the sixth year in a row down to 70%, and spend per primary and secondary pupil has fallen by 8.1% and 3.7% since 2010/11 reflecting changes in pupil numbers. The record proportion of older people assessed to have long-term care needs being supported at home, 61.7% in 2017/18, is listed as another achievement. Total social care spending on adults has risen by 10.2% in the eight years but care user satisfaction has fallen in the past three years to 80%. The report also highlights falling public satisfaction rates for all culture and leisure services in the past 12 months, which are said to have increased their usage rates and costs per use since 2011/12. Conditions on all class A, B and C roads have deteriorated in the past financial year. Cosla president councillor Alison Evison said: "What councils are continuing to achieve for communities is impressive considering the financial challenges we face - but obviously as today's report clearly shows this is simply unsustainable in the longer term." She added: "Make no mistake, Scotland's councils face really difficult choices and will have to take tough decisions in the months ahead, as the demand for our services and the reduction in funding clash head on." Public finance Minister Kate Forbes said: "The Scottish Government has continued to ensure our partners in local government receive a fair funding settlement despite further cuts to the Scottish Budget from the UK Government. "Taken together the enhanced financial package to councils offers £187m of increased funding and flexibility to local authorities, providing additional spending power to directly support their core services, on top of the £11.1bn local government settlement."